What does come to your mind when you think about “core strength”? Most of us would think about six pack abs. But the core is much MORE than a six pack! Among other things, your core is responsible for spine flexion and extension, rotation, stabilization and good posture. So, if you approach core training just by training your six pack, you’ll leave out most of the important stuff. In this post, you’re going to find out 61 bodyweight core exercises to help you target all of these different functions of the core and develop a truly powerful midsection. There are many definitions out there about what constitutes your core. Instead of creating a new definition, I’d like to take the focus off the muscles and instead place it on the movement patterns. For complete core development, you should target all of these movement patterns. Why should you use exercises that focus on your core? 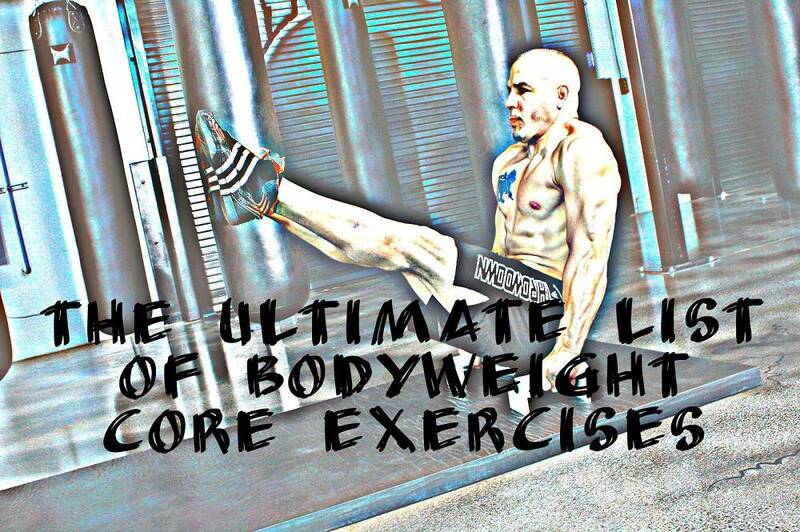 Aren’t bodyweight exercises targeting your core anyway? Yes, calisthenics exercises do train your core (especially as you progress to more advanced movements) and, as you’re going to see, some of the movements below are full body exercises. As such, you can “get away” without targeting your core directly. However, you’re missing on some great benefits of direct core training. It just common sense that if you train your core directly, your core strength is going to be a lot greater than if you trained it only indirectly. Almost all advanced calisthenics moves require a strong core. A great example is the front lever. Training for a front lever is going to strengthen your core, however, if you can already perform a dragon flag, you’ll be able to achieve the front lever must faster, cause you already have the necessary core strength for the movement. In the first section of bodyweight core exercises, you’re gonna find the exercises that are focused on the abs or more formally, the rectus abdomini. The movement pattern that will be trained is mostly spine flexion along with stabilization. The exercises are going to be divided into 3 categories based on their difficulty level. Depending on your training level, these exercises can be used as progressions to more advanced movements or as accessory work in interval circuits. You can make crunches more effective by pausing briefly at the top of the movement and squeezing your core muscles as hard as you can (for a sec or two). Then come back down and repeat for reps. I learned about this harder crunch variation in Never Gymless by Ross Enamait. This exercise is not for complete beginners. You should be able to do at least 20 push ups before trying these out. In case you don’t have an ab wheel yet, inchworm is a great alternative. The further out you extend your arms, the harder the exercise becomes. This may seem like a regular leg raise, but in fact, it’s harder because you can’t lean back to perform the movement. You should be able to do at least 30 consecutive knee wheel roll outs before training for this variation. In this section, you’re gonna find the core exercises that are focused on your obliques. The movement patterns that will be trained are axial rotation, lateral flexion, and stabilization. The exercises are divided into 2 categories based on their difficulty level. Here you’re going to find the bodyweight exercises that target your lower back. The movement pattern that will be trained is spine extension along with some stabilization. The exercises are divided into 2 categories based on their difficulty. This exercise can be also done for reps. In addition, it can be used as a shoulder stretch as well. This exercise can be done for reps or hold it for time. In the beginning, use a wall for safety. You can also put a pillow under your head so it doesn’t hurt. What exercises should I choose? Should I do different exercises every other day or should I focus on one movement? For this workout, you’ll have to choose an advanced core exercise that you’d like to achieve (eg. The dragon flag). Then you’ll choose a progression that you do at least 3×3 reps with it. Furthermore, in Workout A you’ll train with 3-5 sets of 3-8 reps with 2-5 minutes rest intervals. Once you’re able to perform 3×8 or 5×5 with a progression, you’re ready to move to the next one. In the second workout, you’re going to perform a circuit that targets your whole core. Go from A1 to A2 to A3 without rest between the exercises. Then rest for 60-90 seconds. If you can complete 3×20 with an exercise with ease, you can move on to a harder one or add more reps. Workout B isn’t fixed. By that I mean, that you can choose different exercises in every workout to prevent staleness and boredom. You can use these workouts during the same day. For example, you can perform Workout A as part of your regular strength training routine and at the end of your workout (or at a different time during the day) perform Workout B. (I learned this approach from Never Gymless by Ross Enamait). You can train with them on different days. Furthermore, it’s important that you train your core at least 3 times per week. Lastly, don’t forget to stretch your abs frequently, especially after every type A workout. The goal of this post was to “equip” you with the necessary core exercises so you can effectively train your core in its entirety. If you follow a “holistic” approach and train all of the basic core movement patterns, then you’ll develop a truly powerful and functional core. On the contrary, if you focus only on one movement pattern and area (eg. Abs), then you risk developing muscle imbalances and even worse… you’ll be prone to injuries. What exercises are you going to add to your current workout plan?